Today in Williams County history (February 12, 1965, 53 years ago): Lester’s Diner was opened at 233 South Main Street in Bryan by Lester Bammesberger and Norman Clock. Although 14-ounce cups of coffee were a Lester’s trademark, the restaurant was well known for its wide variety of home-cooked style food, informal atmosphere, quick, friendly service and affordable prices. Lester’s Diner was open 24 hours a day for many years. 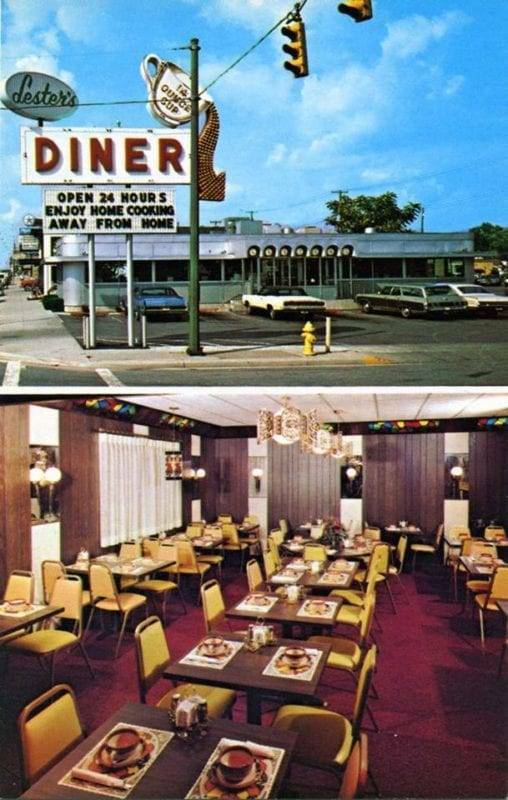 In 1971, to keep pace with its growing business, Lester’s added its “Coffee Cup Room” at the northwest corner of the restaurant with seating for 50 patrons. Lester’s Diner closed on May 30, 2011. The iconic facility is now occupied by the Four Seasons Family Restaurant. This 1970s vintage picture postcard showing an exterior view of Lester’s Diner and its “Coffee Cup Room” is from the Kevin Maynard collection–Courtesy of the Williams County, Ohio, Local History Exchange. Be the first to comment on "(1965) – Lester’s Diner Opens (Bryan, Ohio)"